With summer in full swing, I am delighted to share another great book with you. 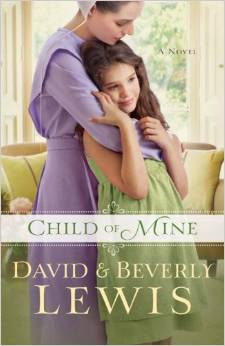 Child of Mine by David and Beverly Lewis centers around little 8-year-old Natalie (Nattie). Both of her adoptive parents were killed in an accident a few years ago. Since then her flight instructor uncle, Jack, has been her guardian. He couldn’t have done it without the help of the Amish nanny, Laura, that has been with Nattie since she was a baby. Like most little girls, Nattie longs to have a mother. She draws pictures of her family – Jack, as the dad; Laura, as the mom; and herself. Her aunt and teacher are concerned that she is growing too attached to Laura. Jack decides to start dating. There are many bumps along the road and he determines it is not worth the trouble. Just as the saying goes, when you stop looking for something is when you find it, Kelly walks into Jack and Nattie’s lives. However, she brings along secrets and baggage of her own. Her own daughter was taken eight years ago. Will Kelly be what Jack and Nattie have both been looking for or will it all come crashing down when secrets are revealed? Child of Mine is an incredible book with many twists and turns that keep the reader turning pages. I highly recommend you add it to your summer reading list.